We wrote a function in the tutorial Functions in Swift with Multiple Return Types and External Parameters named largestAndSmallest which returned a tuple of two integer values. We can accept this returned tuple in two separate variables enclosed with parenthesis and use them separately in our code. Now, we have just access to the first element returned by the function largestAndSmallest. Here, we’ve a three dimensional point represented by tuple named point3d. The co-ordinates are named and thus by accessing the x and y values of point3d, We can create a two dimensional point point2d. But since this tuple does not have named elements, we can’t access them using names. However, we can access them using numbers. Note: This is not listed in the book “The Swift Programming Language”, so this behavior may or may not be available in future beta releases - although I don’t think that should be the case. Notice how we are accessing the Street and Apartment which are elements of Address tuple nested in personInfo. However, it’s not preferable to use tuples for more complex data structures, as they have temporary local scope. Classes, Structures etc. would be a rather apt choice for your intricate data structure design purposes. Switch Statements in Swift are similar to C/C++ based Switch statements, providing an alternative to a complicated nested if-else statement structure, but there are some important differences. However, if you do want the typical C/C++ default Switch behavior, you would have to use keyword “fallthrough” after each switch. The above example will execute all the switch’s cases and thus print all the properties of the shape square, which is also a Rectangle, which is also a Quadrilateral. Here is a list of differences discussed above for quick reference. 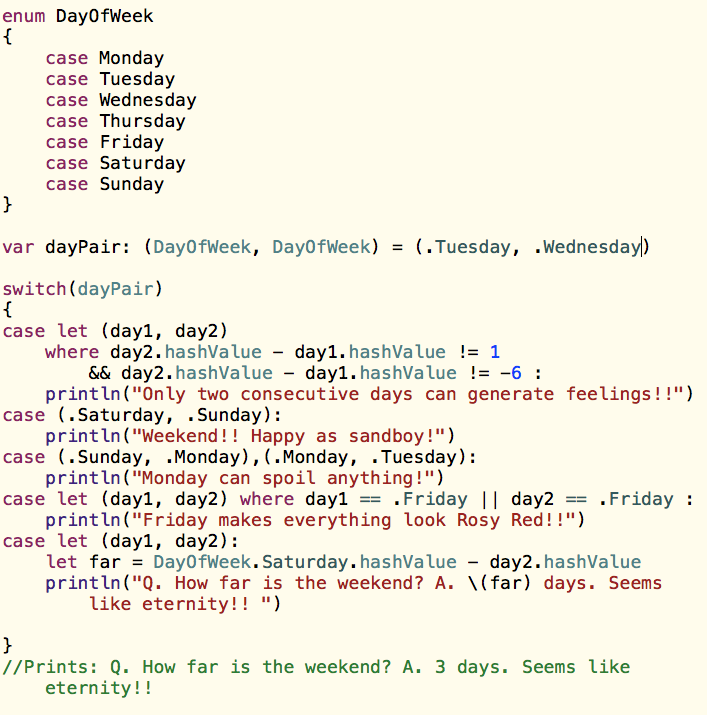 Cases in Swift switch statements break by default and fallthrough is needed for classic Switch behavior. A switch statement is Swift has to be exhaustive, handling all possible values in cases. Swift’s Switch statements can use not integral values like strings, enums and tuples too for matching. Cases in Switch statement of swift can use multiple values separated by commas, and open/closed ranges too. A single value can match multiple Switch statements, however, only the first match is considered. Tuples can also be used in Switch statement, either by themselves (normal equality check), or along with underscores and where clauses to construct powerful pattern matching constructs. In this example, we’ve used where clauses to check conditions and perform sophisticated matching. We can check for equality, execute expressions, and invoke functions. If a value is not required in a particular “case”, we ignore it with an underscore. We can use ranges for checking our values fall in particular set of numbers. And finally, a default case is not required here, as we’ve omitted the where clause in the last case, which essentially means that any value of x and y would be matched and handled in this case. Now consider the following example. The tuple “name” contains two string values, which we’ve labeled with firstname and lastname. The first case performs a match with simple string literals. The second one though, equates the two strings, notice that it uses names different from the labels of tuple elements. These are temporary names, only accessible inside the body of the specific case. Finally, we’ve commented out the default case, as with the absence of a where clause, the last case will handle any two pair of strings, making our switch exhaustive without a where clause. We started with tuples in Swift. And then we moved on to the powerful Swtich statements in Swift, without which the discussion of tuples would be incomplete. 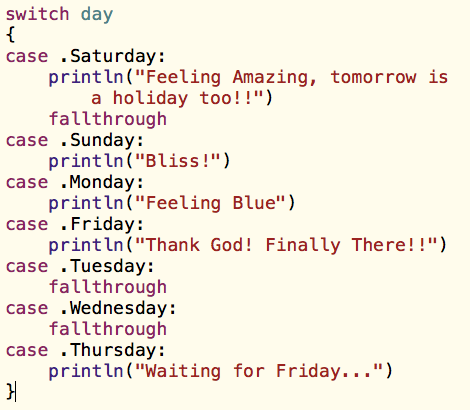 That’s because of the powerful pattern matching constructs we can create by using Tuples in Switch cases. We also listed a few differences from the classic C/C++ style switch statements. That’s all for this post, stay tuned.